Citroën C4 Cactus has once again won the accolade of ‘Most Popular Small Family Car’ in the Honest John Awards 2016. The award winners are recognised based on the car reviews that generated the most user interest on the HonestJohn.co.uk website over the past year. Scooping the honour for the second consecutive year, Citroën C4 Cactus demonstrates its continued dominance and popularity in this hotly contested category. The ultra-stylish Citroën C4 Cactus has been named the ‘Most Popular Small Family Car’ for the second consecutive year in the Honest John Awards 2016. Now in their sixth year, the Honest John Awards recognise and reward the cars and vans whose reviews created the most interest amongst their website users over the past twelve months. 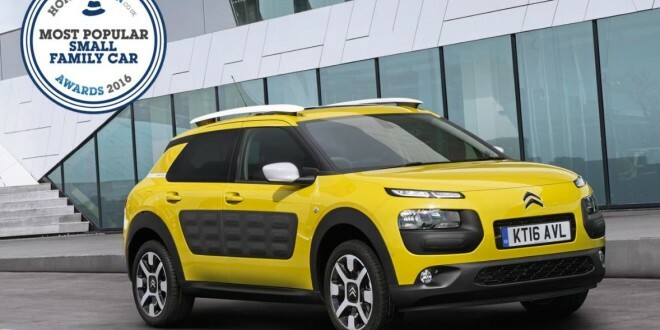 Citroën C4 Cactus boasts a bold personality with striking features such as the innovative Airbump ® panels that protect the car from small everyday dents and scrapes. The presentation of the Honest John award comes only days after the highly-acclaimed C4 Cactus scooped another top honour in DieselCar Magazine’s ‘Top 50’. These accolades add to the impressive list of UK industry awards received since the car’s launch in September 2014.